Glutinuous rice cakes like biko is one of my favorite Filipino delicacy. It is my very favorite snack, dessert, breakfast, etc. that if I'm to choose between a chocolate cake (which is also a favorite of mine) and biko, I will always choose the latter. That is most specially when it is cooked like the Japanese steamed rice style - sticky and the grains look longer, fuller, and firmer. And as much as possible, I don’t want a glutinuous rice cake that is overcooked nor too soft nor soggy. I just want it to be just right to the bite, firm, and a bit chewy but not hard and rubbery. I grew up knowing and calling this glutinous rice cake as kankanen (Ilocano term) and my Lola Paring and Mama Tessie always find time to cook kankanen for our afternoon snack. 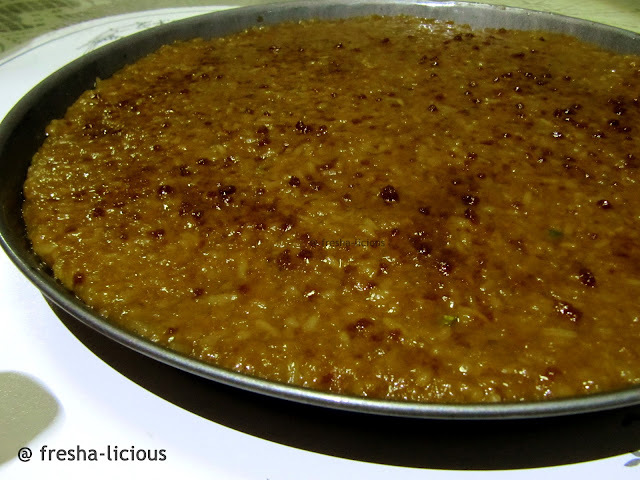 I remember my Lola Esting who cooks one of the best biko / kankanen in my hometown. Yet, despite being surrounded with family and relatives that cooks delicious kankanen / biko I never learned how to make one. I am actually hesitant to cook glutinous rice cakes because I don’t know how to cook it. And I’m afraid that I might not be able to get the right taste and texture of biko / kankanen that I like and embarrass myself in the process :-( . So cooking biko is never in my cooking list priority. My husband knows that I love biko / kankanen that's why, when we bought biko / kankanen at one of those Filipino stores at Lucky plaza, he promised to cook biko for me. And so Frederick did cook biko / kankanen, the following day, for me. It was not as perfect as I wanted it to be, coz it was soggy and overcooked :-( nonetheless, it still tasted good and scrummy. Here is his first biko / kankanen recipe. 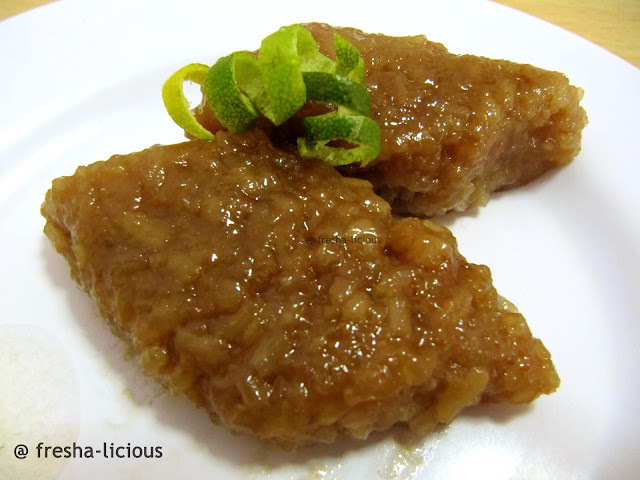 Frederick is half-Cagayano so he tried to follow the Cagayano way of cooking this rice cake. Glutinous Rice - 500 g.
Muscovado Sugar - 200 g.
Brown Sugar - 350 g.
1. Wash the glutinous rice and soak it in water for about an hour. Drain and transfer it to the pressure cooker. 2. Add water (4 cups) and bring it to a boil. Once it starts to boil, remove from heat and drain in. 3. In a double boiler, boil water. Place banana leaves on top of the steaming plate / basket. If banana leaves are not available, use aluminum foil. 4. In a large bowl enough to contain the glutnous rice, mix the oil, calamansi rind and sugars (the muscovado and brown sugar) with the half-cooked glutinous rice. 5. 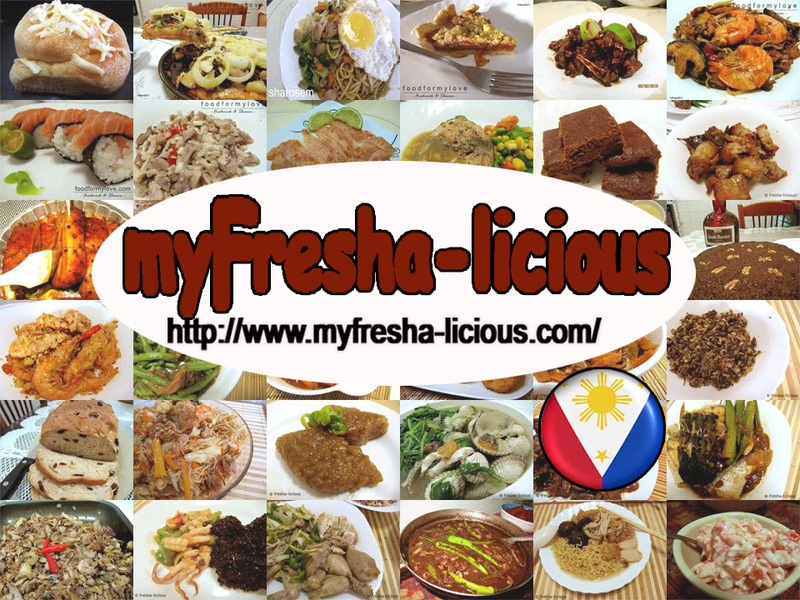 Transfer it to the steaming basket covered with banana leaves or aluminum foil. 6. Steam the glutinous rice until it’s cooked. 7. transfer it in a serving dish, flatten the biko and sprinkle it with muscovado sugar.